So I'm a CYBILS nonfiction judge this year. And I should be blogging about all of the terrific books I'm reading every day. Time to get started. SHARK LADY: THE TRUE STORY OF HOW EUGENIE CLARK BECAME THE OCEAN'S MOST FEARLESS SCIENTIST is the biography of oceanographer Eugenie Clark. The book follows Eugenie's life long love affair with sharks, starting at an aquarium when she was a little girl. In 1986, when she was 64, she made the first of over 12,000 trips in a submersible. In 2014, she celebrated her 92nd birthday by diving in Jordan and Israel. In between those years, she earned a doctorate in zoology, was a professor and author, discovered many new species of sharks, was the first to train sharks to prove their intelligence, and advocated for protection of our oceans. The book reads like a story, and that, along with Maria Álvarez Miguéns illustrations are lively and colorful and sure to hold kids' interest. Lots to love about this book. Of course you could use it as a biography. But you could also use it to help kids understand that the passions they pursue in childhood really could lead to life long work. You could use it to show how important it is to persevere when people tell you your dreams aren't realistic. Or to show kids about all of the different ways of learning about a topic- Eugenie studied sharks in museums, read books and articles, took classes, and finally learned to dive. She kept track of her learning in research notebooks. And there were lots of great extras. The end pages are various kinds of sharks (I wondered if these were the species that Eugenie loved most or discovered or ????). 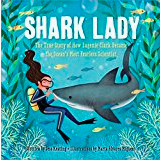 Back matter includes a page of "Shark Bites," (facts about sharks), an illustrated timeline, and author's notes. Definitely a great addition to your picture book biography library. I am the literacy coach/interventionist at my school. In August and September, that means I do testing. Lots of testing. And specifically, lots of testing with kindergarteners. I do not love testing kindergarteners. I am administering a state-mandated, computer-based test to one of my five-year-old friends. The test measures students' understandings in things like phonemic awareness, listening comprehension, vocabulary, and fluency. And it's timed. F was about five minutes into the test. I was standing about six feet behind him, and about five minutes into the test, he turned around to talk to me. "Dr Carol, did you know it was my birthday this weekend?" I tell him I didn't, but that I can't wait to hear about it. After he finishes taking his timed test. He turns back to the test, but a few seconds later, he has more news. "And did you know I had a Ninja Turtle party. And M and D and W came. But Joe didn't came." I try to be polite and attentive as I redirect F again. "And I had a bouncy castle. It was the one with the Ninja Turtles. The ones coming out of the sewers." Once again, I try to be politely attentive as I redirect my friend's attention. He lasts about five seconds this time. I assure him that I bet his cake was beautiful. And that it's ok if he didn't bring me any. I can wait until his next birthday, when he turns seven. And all the while, the clock on the standardized test is ticking and ticking and ticking. And I'm wondering how anyone could possibly think this could be a good measure of this little guy's literacy skills.